Cornelia Class, a geochemist at Columbia University's Lamont-Doherty Earth Observatory, had come to puzzle out how much of this strange rock is here and how it arrived. According to the ruling theory of plate tectonics, ocean floors are purely volcanic, made of basaltic lava that squirts from underwater rifts. Islands like Anjouan (and Hawaii) form when more magma punches up somewhere through already-formed ocean floor. Continents, on the other hand, sit apart from the ocean floors; they are made of generally much older, complex mixtures of igneous, sedimentary and metamorphic rocks. Over vast stretches of time, continents may move around, split up and recombine; occasionally they leave behind stranded fragments that may variously be referred to as islands or microcontinents; Madagascar, once part of east Africa, is one such fragment. Anjouan stands alone—the only island in the world formed by volcanism that also contains an intact chunk of continent. "This is contrary to plate tectonics," said Class. "Quartzite bodies do not belong on volcanic islands." Anjouan, also known as Nduzwani, belongs to the Comoros, a tiny nation archipelago lying near the equator between east Africa and Madagascar. Populated by peoples from the African mainland, the Mideast, South Asia, Indonesia and Persia, later colonized by France, it is a cultural crossroads. Each island has its own dialect, incorporating elements of French, Arabic and Swahili. Islam is dominant, but mixed with distinct island traditions. The rich volcanic soils yield large amounts of cloves, vanilla and ylang ylang flowers, a central ingredient in many expensive perfumes. Beautiful scents often permeate the air, but not much money from the export trade seems to filter down; this is one of the world's poorest countries, and most people remain subsistence farmers. 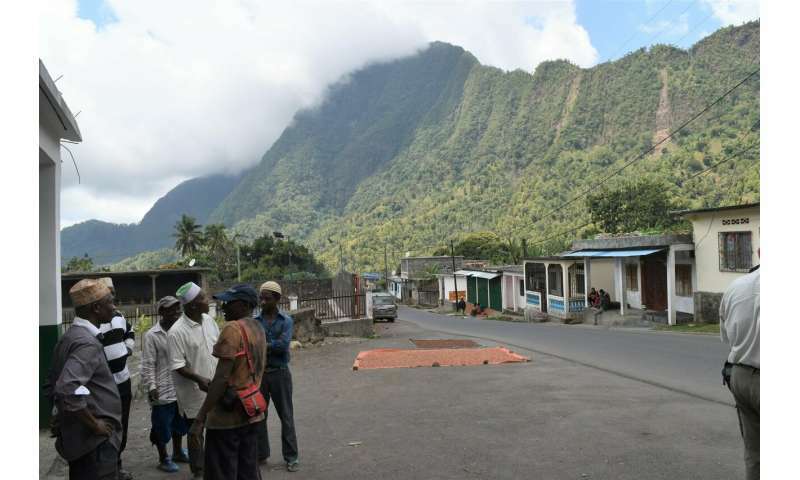 Furthermore, Anjouan is dominated by the much larger island of Grande Comore, and has been the scene of repeated uprisings—the most recent in October 2018, when six days of shooting and explosions killed an unknown number of people in the capital city of Mutsamudu before government troops took back control. There is no direct route to Anjouan from almost anywhere, and few facilities for visitors. Via email, volcanologist Hamidi Soulé of the Comoros' National Center for Documentation and Scientific Research (CNDRS), offered to collaborate, and arranged logistics. From New York, it took Class and her colleague Lamont geochemist Steven Goldstein three and half days to reach the Anjouan site. Along the way, they picked up Christophe Hemond of France's University of West Brittany, and myself. For Class, Goldstein and Hemond, it was a kind of reunion. In 1991, while all at Germany's Max Planck Institute, they had spent a season studying volcanism in the Comoros. They had always wanted to come back to this exotic, lovely place. Quartzite starts out as a type of the sedimentary rock sandstone, made of pure quartz sand grains collected in a river delta. When further buried and compressed, the grains fuse together, metamorphosing into extremely hard, dense quartzite. The rock could not have formed on Anjouan, because the basalt that formed the island does not contain any quartz. Even if it did, Anjouan's terrain is too young and steep to have ever formed much of a river delta; its streams rush through chasms down the precipitous slopes to its cobbled shores. Geologists reported seeing unusual rocks in the Comoros that may have been quartzite as early as 1900, but these were small and not well documented. In 1969, British geologists reported a formation of what they called sandstone, comprising a small hill about 250 meters on each side, near the Anjouan hamlet of Tsembehou. In 1980, French geologists mapped it in more detail, describing it as quartzite. In 1991, Class, Goldstein and Hemond noted the formation, but were too busy studying the volcanic rocks to pay much attention. Then in 2017, French geologist Patrique Bachèlery of the University of Clermont Auvergne spotted what he believed was another patch of the same stuff on a nearby ridge. Class was intrigued. Armed with the old data, Bachèlery's newly hand-drawn map, and a grant from the National Geographic Society, she was out to determine just how big this formation was. The team's aim was to dig out samples for later chemical analysis that they hoped would provide clues to the deposit's age, origin and history. The quartzite is almost certainly very old. Starting around 800 million years ago, a supercontinent that geologists call Gondwanaland formed, out of tectonic plates that now comprise South America, Africa, India, Australia and Antarctica. It began breaking apart about 180 million years ago, and from about 165 million to 130 million years ago, Madagascar split from east Africa, forming the ocean basin where the Comoros lie. Finally, Anjouan popped up in the basin about 4 million years ago. The volcano that formed Anjouan is now extinct, but eruptions still occur on Grande Comore, and rumblings in 2018 on the seafloor near the sister island of Mayotte suggest that magma is still sloshing around somewhere below. Given the Comoros' location between Africa and Madagascar, the quartzites arguably came from one or the other. Which one, and how was the question. Anjouan came into view from our small plane as the setting sun was turning clouds golden. The extinct volcano had eroded from what was originally a huge, shield-shaped edifice into a complex of impossibly steep mountain ranges, laced with deep, forested valleys in what was once the volcano's interior. At dusk, we landed on a tiny coastal airstrip; nearby, a vigorous trash fire lit the grounds. Giant fruit bats, one of the islands' signature endemic creatures, swooped through the trees. Next day the team, joined by Soulé, navigated in a pickup truck up windy mountain roads to Tsembehou, nestled in an interior valley ringed with cliffs. Here we met Bourhane Abderemane, a senior CNDRS scientist living on Anjouan. After getting the blessing of town officials, we wrestled the pickup along a narrow dirt track at the foot of a ridge called Habakari N'gani, where the initial 1960s finds had been made. Winding through plantations of manioc and vanilla, the track was overshadowed by trees bearing cloves, bananas, coconuts and ylang ylang. A mile or so in, the scientists got out and started hunting on foot for unusual rocks amid countless dark chunks of basalt that generations of farmers had dug out and dumped in heaps or built into walls. Hemond spotted the first quartzite, within minutes. It was a light-colored, sharp-edged cobble about the size of a grapefruit. Several whacks with a hammer revealed a white, unweathered interior, sparkling with quartz. When struck with the hammer, it gave off a smoky, sharp whiff of what Goldstein described as "silica smell." Class was delighted. The scientists followed a bread-crumb trail of quartzite chunks up a ridge so steep and rubbly, it could be climbed in spots only on all fours. Amazingly, almost all of it was cultivated with plants and trees; Anjouan's fast-growing population is struggling to feed itself, and nearly every square foot of the island not occupied by buildings or actually vertical is used for agriculture. Next day, the scientists drove around the edge of the island, looking for random road cuts and excavations. These are a geologist's best friend, especially in the jungly tropics; they conveniently expose rocks that almost everywhere else are covered by soil and vegetation. At one point, they came upon seven men digging into a hillside to level out a site for a mosque. In the side wall were exposed chunks of basalt laced with xenoliths—rocks within rocks—made of gemlike green olivine crystals from the deep earth. These may contain clues to the nature of the oceanic plate on which the island was built; with the workers' permission, the scientists collected a few choice samples. No quartzites, though. Before leaving, the scientists took up a collection to help with construction of the mosque, and handed over the cash to the crew. The following day, it was back to Tsembehou to look for the site of the 2017 quartzite find. In a streambed near the site marked on the map, they quickly spotted a few loose chunks. A man herding cows told them there was more uphill, and pointed out a footpath. The scientists slogged up, taking turns lugging a 10-pound sledge hammer, banging on rocks as they went. A few modest chunks of quartzite soon turned up along the trail. Suddenly, from seeming nowhere, five boys between the ages of about 10 and 15 appeared and began tagging along They watched the scientists' every move with great curiosity. After a while, one of them volunteered to carry the sledge. At a small level spot, the scientists came upon the largest quartzite boulder yet: sticking out of the dirt, it was big enough to sit on. In some bushes nearby was an entire ledge of the rock—apparently an outcrop, the exposed edge of the underlying rock from which the loose chunks downhill had eroded. This was now not just a bread-crumb trail; it was the tip of the quartzite iceberg. The only question was how big a berg. The scientists were giddy. "If this were gold, we'd be rich," said Goldstein. Parts of the outcrop were striped with dark veins of basalt, apparently marking the outer edges of the formation, where magma had intruded and mixed in with the exotic rock. In French, Hemond explained to the boys how the rocks may have formed. The kids listened raptly. 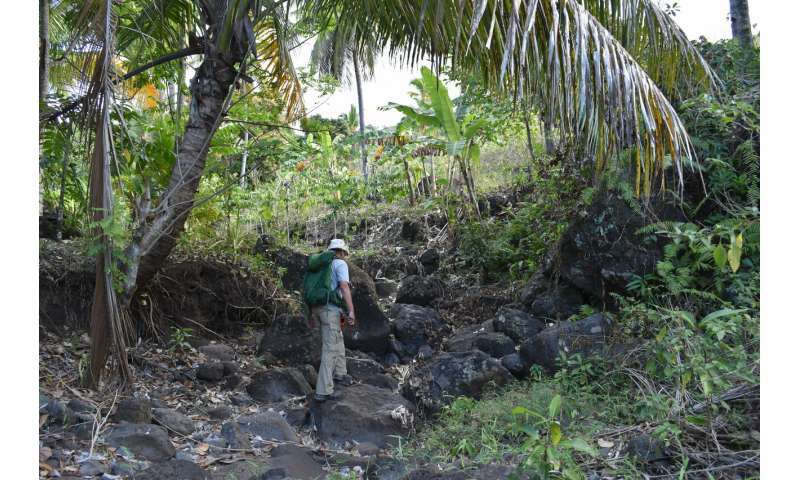 While the scientists pounded out samples of the rocks and discussed the fine points of basalt-quartzite interactions, one of the kids expertly shinnied 50 feet straight up a coconut palm and started throwing down fruit. The oldest repurposed a sharp-edged geologist's hammer to open the coconuts and offered everyone fresh milk. On succeeding days, the team worked to connect geographic dots that could suggest how big the formation might be. Obviously, it was much bigger than originally thought. Following the main road on the opposite side of Habakari N'gani, they stopped at each creekbed they came to. At most, amid the basalt boulders, they found a few quartzites, apparently washed down from somewhere further up. 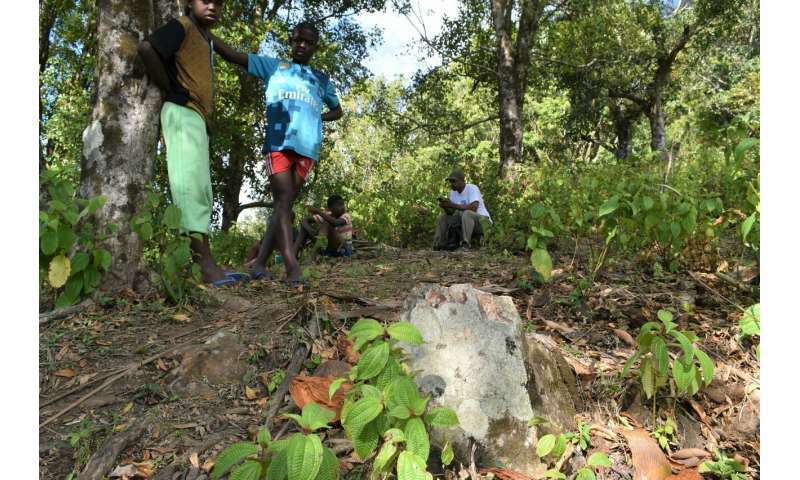 At a bridge near the village of Bambao M'Tsang, Abderemane pointed at a stone building foundation: amid its basalt blocks was one pure white one. A man observing the scientists fussing over this rock walked over from a nearby house with a big smile, and held out a fist-size chunk of the same stuff. Hemond asked where it came from. "We find these all the time when we're planting manioc," said the man, whose name was Ali Saindou. "People use them to sharpen knives." At this, he pulled out a worn but sizable knife and vigorously massaged the blade across the hard, crystalline surface. A couple of women came out of the house and began to laugh, whether at Saindou or the scientists, or both. Further down the road, the team hiked up another creek bed and found more quartzite cobbles. While they were examining them, a farmer named Saindou Boura emerged from a garden plot along the bank and greeted them. Abderemane asked him about the white stones, Boura bent directly down and hefted up a head-size specimen at his feet that the scientists hadn't noticed. You can find these all the way up the mountain, as far as you can walk, he said. Great for sharpening knives, he confirmed. "This thing is big," said Class of the quartzite formation. "Much bigger than we thought. This is a major discovery." Saindou Boura took us to meet his younger brother Mourchidi, his brother-in-law and a young nephew, who were digging in a manioc plot. In French, Hemond and Class went through a layman's explanation of the rocks' origins, venturing that the quartzite must have formed in Africa or Madagascar, then somehow ended up here when ancient landmasses rearranged themselves. Oh, you mean when Africa and Madagascar were part of Gondwanaland? queried Mourchidi Boura. At this, the scientists were dumbfounded: No non-geologist anywhere could be expected to know what Gondwanaland was, much less a farmer working the soil by hand on a tiny, remote island. Clearly, the scientists had underestimated these folks. Toward the day's end, the team was driving back toward Tsembehou, when Class asked for the pickup to stop. She got out and peered to the opposite side of the valley, a couple of miles away, at a section of sheer cliff on Habakari N'gani. In the early evening light, it appeared to be pure white. After inspection with binoculars, the scientists decided that this could be a giant outcrop of the quartzite, staring down at them the whole time. The only way to find out was to go there. The scientists nicknamed it "Mont Blanc." Two days later, a local guide took us along a maze of pathways to a clearing below the cliff. From here, we grappled up an impossibly steep, talus-covered slope, slipping and sliding backward. Somehow, people had planted banana trees and vanilla vines even here, and they were growing. Finally we reached the base of the cliff, where cultivation ended and bare rock began. Up close, the rock did not look so white. Class and Goldstein hammered at it. As they chipped off the surface, it became clear that this was just a series of lava flows; the usually dark basalt had been lightened by exposure to weather. "OK," said Goldstein. "We don't know unless we look." Amazing story combining adventure and science. I thoroughly enjoyed and wish that I could have been with them in their journey.